Simon Thornley hairdressing Sutton Coldfield is a premiere hair salon and offers the highest standards of professional hairdressing together with unparalleled service and the best customer care. Our highly trained team of hair professionals insist on using only the best quality products from L’Oreal professionnel and Fuente organic. Specialists in colour with premium hairdressing services in a relaxing environment carried out by highly trained professionals along with premium products by L’Oreal professionnel and Milkshake. We are experts in all types of colour with a passion in colour correction. We don’t just wash, cut and colour your hair… we cleanse and massage using the best L’Oreal shampoos and conditioners, leaving your senses wanting more. Simon Thornley Hair Design in Sutton Coldfield is conveniently situated adjacent to a large carpark and within easy reach of the town centre. A thorough consultation is carried out before all services to ensure you get the best cut and colour result – the one you wanted, after all, if you look good – we look good. or click the ‘book online‘ tab to make an appointment with one of our professional hair stylists and see for yourself what brings clients back again and again. 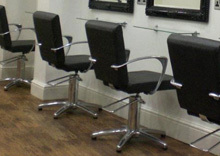 A premiere hairdressing salon Sutton Coldfield, since 2006. By subscribing to our mailing list you will always be kept updated with the latest offers and new from us. © Simon Thornley Limited. All Rights Reserved.